Tizoxanide is the main active metabolite of nitazoxanide. Nitazoxanide and tizoxanide have a broad-spectrum anti-infective effect, including parasites, bacteria, and virus. 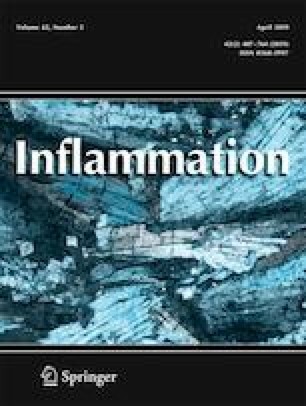 In the present study, we investigated the anti-inflammatory effect of tizoxanide on lipopolysaccharide (LPS)-stimulated RAW264.7 cells and revealed underlying molecular mechanisms. The results showed that tizoxanide significantly suppressed production of NO as well as pro-inflammatory cytokines, such as IL-1β, IL-6, and TNF-α in dose-dependent manner. Meanwhile, the levels of gene expression of these cytokines were inhibited significantly by tizoxanide that was discovered using RT-PCR. The increased protein levels of inducible nitric oxide synthase, heme oxygenase-1, and cyclooxygenase-2 by LPS in the cells were also reduced by tizoxanide. Moreover, we found that tizoxanide inhibited the phosphorylation of IKK-α and degradation of IκB by LPS in macrophage cells. The increased protein levels of p65 induced by LPS in the cytoplasm and nucleus were both decreased by tizoxanide, and the nuclear translocation of p65 was also restrained in cell imaging. In addition, tizoxanide considerably also inhibited LPS-activated JNK, p38, and ERK phosphorylation in RAW264.7 cells. Taken together, our results suggested that tizoxanide exerts anti-inflammatory effects, by inhibiting the production of pro-inflammatory cytokines and suppressing of the activation of the NF-κB and the MAPK signaling pathways in LPS-treated macrophage cells. Jiaoqin Shou and Xiangzhen Kong contributed equally to this work. This work is financially supported by the National Key Technology Research and Development Program of China (2015BAD11B00). This project is also supported in part by the National Natural Science Foundation of China (31872516) and the National Key Research and Development Program of China (2018YFD0500302).